Embrace those around you, discover a reason to smile in every situation, and find purpose in compassion - these are some of the lessons I learned from volunteering at my local family homeless shelter, and they inspired me to create Kids First Project. Five years ago, I stepped foot in my local family homeless shelter in Portland, OR, for the first time. I had no idea what to expect, and was shocked to see so many kids, learning that the average age of a person experiencing homelessness in the US is just 9 years old. One of the first kids I met was Norena. Just a year younger than me, she became an immediate friend. Although we were similar in many ways, I would be reminded of our differences when I noticed that she had nowhere in shelter to quietly study, had long commutes just to get to school every day, and had no opportunity to participate in the extracurriculars that I found myself often taking for granted. Despite all of this, she made the most of her situation, going out of her way to create activities for the younger kids in shelter when she wasn’t doing homework. Norena inspired me to find a way to bridge the gap between youth experiencing homelessness and their access to critical resources, leading to the creation of Kids First Project, which brings educational and recreational programs to youth experiencing homelessness living in shelters. We have provided hundreds of kids with mentors and tutors, arts and crafts, poetry, STEM activities, lacrosse workshops, and more. And today, we’re working on creating a nation-wide advocacy campaign to push for stronger legislation to ensure youth experiencing homelessness across the country have access to the same programs. There are many people involved in making this possible. First, I’d like to thank my friend and fellow activist, Josh Kaplan, for taking the time to nominate me. I’d also like to thank the Kids First team, our partners, and our volunteers for their endless passion and dedication, and my family and friends for their invaluable support. 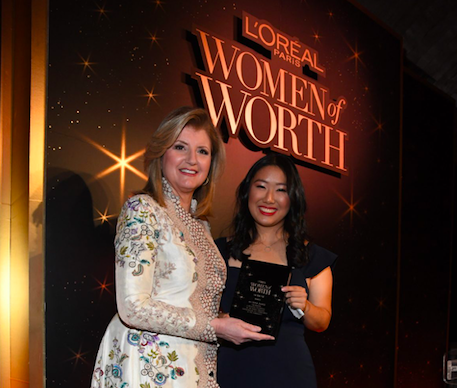 Thank you to L’Oreal and Points of Light for elevating the voices and stories of so many incredible women. As I was reading the bios of each honoree, I couldn’t help but be inspired by the change they’re creating in their local communities and beyond. It is an incredible honor in and of itself to be recognized alongside them tonight. Being selected as a Women of Worth Honoree also motivates me to use my platform to do more. I hope that Kids First Project can continue to raise awareness on the issue of youth homelessness, and motivate people to do what they can to help. Last but not least, I’d like to thank Norena. Thank you for teaching me to embrace the people around me, to discover a reason to smile in every situation, and to find purpose in compassion.